Grisedale Cottage Self-cateringSet in the delightful Newlands Valley at the foot of Catbells and Causey Pike, Grisedale Cottage makes a great base for a holiday in any season. From here you can make the most of some of the finest peaks in the Lake District and with valley rambles for easier days and plenty of places to visit by car you will never be short of something to do. For the more energetic the Newlands Adventure Centre is close by, offering a range of activities such as rock climbing, canoeing, ghyll scrambling and archery. For a more leisurely pace take a short walk to Derwentwater (about a mile and a half) and catch the launch from the pier to sail across to Keswick or down to Grange in Borrowdale. You can walk beside the nearby Newlands Beck, stroll up to the Swinside Inn for bar meals, or take a short drive to Braithwaite for the village shop and a choice of pubs. Keswick has year round theatre, cinema, markets and shopping. Accommodation: This attractive cottage is at the end of a short row of 19th century former mill workers' cottages with a more recent extension adding a real feeling of space. Entrance up a few steps into the little hallway with coat stand and hooks. A doorway leads to the second bathroom with shower, basin and wc. Cosy sitting room with bay window (TV with freesat HD, Blu-ray DVD, video, Wi-Fi) and multi-fuel stove. Three steps lead up into the dining kitchen, which has a rear door to the garden and windows at each end. Stairs from the kitchen access the first floor where there are three good sized bedrooms - one double with king-size bed, one double and one twin. Family bathroom has bath with separate shower, basin and wc. Grisedale Cottage is comfortable in all seasons with fitted carpets throughout, some exposed beams and a cosy cottage feel. Heating is electric with off peak storage heaters, panel heaters throughout and there is also a multi-fuel stove in the sitting room. Outside: Enclosed wooded gardens mostly of lawn with mature trees and shrubs. Patio and Picnic table outside the kitchen door. Lockable bicycle store. Private parking for one car plus further parking at a small extra charge (honesty box). Phone box in lane behind cottage approximately 50 yards. Pub half mile, village shop two and quarter miles, Keswick three and half miles, Buttermere 5 miles. Set in the delightful Newlands Valley at the foot of Catbells and Causey Pike, Grisedale Cottage makes a great base for a holiday in any season with challenging high level walks, easier rambles and places to visit.....perfect. Grisedale Cottage offers weekly bookings starting on Saturday. From the M6 Junction 40 take the A66 west toward Keswick and Cockermouth, by-pass Keswick and take the turning to Portinscale. Continue through Portinscale and follow signs to Stair. 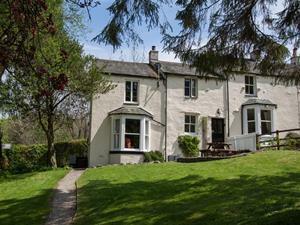 Grisedale Cottage is the end of terrace property facing you as you enter Stair. Follow road round to right for parking. From Penrith railway station, take a bus (X4, X5, X50 Operator Stagecoach-in-Cumbria) to Keswick bus station. From the bus station take a taxi to Stair in the Newlands valley.